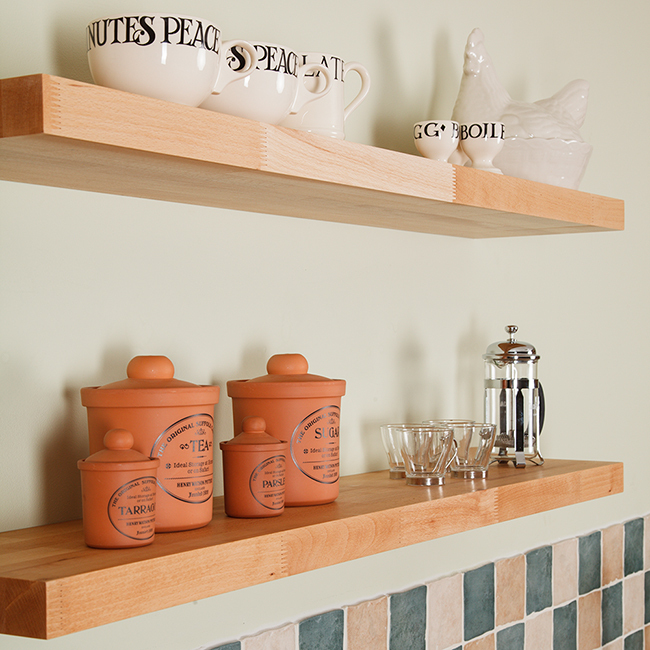 Our beech shelving makes an impressive kitchen feature, with a distinctive grain pattern and warm and appealing hue. For your convenience, this beech floating shelf comes pre-drilled and ready for installation, with the required supports for creating an impressive floating effect. This beech shelf has been carefully constructed by a team of wood specialists, with years of experience of working with hardwoods. Using the latest manufacturing techniques, these shelves are made with precision and - once cut to size - are sanded and oiled to create a smooth and well-nourished grain. This floating solid beech shelf measures 1500mm X 200mm X 40mm and has been crafted with a contemporary square edge profile. Made using the same method are our remarkable solid beech worktops, each shelf comprises a series of 40mm-wide staves, finger-jointed and glued under high pressure for maximum strength. This extra-long beech shelf comes with four specialist shelf supports, which are perfect for mounting onto a solid brick or concrete wall. If you have partition walls, we recommend fixing the supports directly into the timber studs to ensure the shelf has sufficient support. Sometimes real wood shelves can feature natural developments such as small knots or splits; though rare, these characteristics are to be expected and contribute to the wood;s innate natural beauty.